Ormeloxifene is a selective estrogen receptor modulator (SERM). Zuclomiphene is a nonsteroidal selective estrogen receptor modulator (SERM) of the triphenylethylene group. Cyclofenil is a non-steroidal selective estrogen receptor modulator (SERM). Cyclofenil displays higher affinity for estrogen receptor β (ERβ) than for ERα. Arzoxifene Hydrochloride is the hydrochloride salt of arzoxifene, a synthetic aromatic derivative with anti-estrogenic properties. 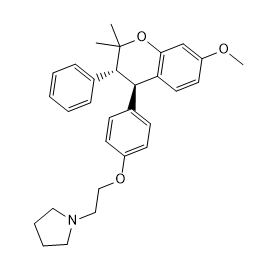 Acolbifene (EM652) is a fourth-generation selective estrogen receptor antagonist with a LC50 value of 22±3 nM. 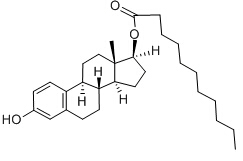 2-methoxyestradiol (2ME2) is a natural metabolite of estrogen that is known to inhibit HIF-1 alpha with an IC50 of 0.71 ± 0.11 μM for the inhibition of BPAEC migration. Estradiol undecylate is used in the treatment of prostatic cancer.